This book is about human abilities and the ways in which people acquire and extend them. It contains many useful facts about people's learning and the mental processes that make it possible. Chapter one looks at the kinds of events that create learning, and identifies some important general principles of human learning. Chapter two examines the capabilities that children gain in their early years. They acquire a number of basic capacities that they can draw upon throughout life. These include language, reading, and numerical abilities. The acceleration of early abilities is also considered. Chapter three raises a number of intriguing questions about abilities. What exactly are they? What are their most important charactersitics? How can different capabilities and items of knowledge become joined to one another? The answers are surprisingly different from what common sense predicts. ; Chapter four Considers The Important Contributions Of Motivation. A Person Has To Have good reasons for engaging in learning activities. Motivation supplies incentives for doing whatever is necessary in order to make learning happen. Chapter five investigates more advanced attainments. It looks at the effects of practising and other ways in which individuals extend their expertise. The use of memory aids and learning techniques is examined. Other topics include the influence of intelligence, creativity, the possible roles of innate gifts and talents, and child prodigies and geniuses. The best way to apply discoveries concerning learning and the acquisition of abilities is to use them for our own daily activities. Chapter six addresses the question of how to learn and study more effectively. It introduces ways of reading more effectively, and gives advice on improving writing skills and studying for exams. The aim here is to help the reader to succeed better at gaining needed capabilities. 'Professor Howe does not attempt to review each area in depth. Rather, he takes key examples of research and uses them to illustrate the points that he wishes to make. As such, the book makes an excellent starting point for discussing many of the key issues that it addresses. 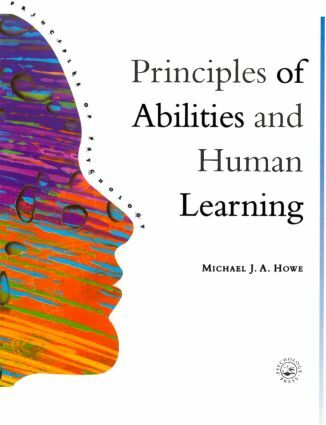 I can imagine it engaging the interest of many newcomers to psychology by its direct discussion of issues that will seem relevant to those readers Principles of Abilities and Human Learning provides an excellent, easy read, companion to fuller introductory texts. It is not a substitute for such texts but it could engage many students where such texts might fail.' - Peter Morris, Department of Psychology Lancaster University in the British Journal of Educational Psychology 1999 No 69. 1. Gaining Human Abilities. Where Do Abilities Come From? Learning and What it Achieves. How This Book is Arranged. Principles of Learning: 1. Active Mental Processing. Principles of Learning: 2. Making Meaningful Connections. Principles of Learning: 3. Repetition. Summary. 2. How Children Gain Basic Capabilities. The Beginnings of Learning. Language. Reading. The Beginnings of Numeracy. Physical Skills. Advantages and Disadvantages of Accelerated Early Learning. Compensating for Early Deprivation. Getting Prepared for School. Summary: How Children Gain Basic Capabilities. 3. People's Abilities: What Are They? What is an Ability? Are Abilities Fixed or Fluid? To What Extent are a Person's Different Abilities Independent of One Another? Do Abilities Transfer? Do Specific Abilities Depend on General Intelligence? Are Some Abilities Unchangeable? Summary. 4. The Role of Motivation. Indirect Influences on Learning: Attention, Motivation, and Study Habits. Attending. Varieties of Motivation. Good Learning and Study Habits. Summary. 5. Towards More Advanced Abilities. Applying Learning Principles: 1 & 2, Active Mental Processing and Forming Meaningful Connections. The Idea of Expertise. Gaining Exceptional Abilities. Innate Gifts and Talents. Prodigies. What is a Genius? Creativity. Summary. 6. Becoming a More Successful Learner. Being More Effective. The Value of Organising One's Time and Activities. Reading to Learn. Writing. Studying for Examinations. Summary. Glossary.